I have been baking at least 2 times a week every since the weather started getting cooler. I revisited a recipe I had for French bread. The recipe is NOT authentic French bread, so I’m just going to call it a recipe for baguettes. If you plan on baking at home, you should carefully select your bread baking tools. The baking tools and equipment you select will have an effect on how the finished product turns out. Don't believe me? Try baking biscuits on a baking sheet from the dollar store and let me know how that works out for you. Thin, cheaply made materials don't last very long, and some of them can cause your baked goods to turn out lighter or darker than intended. In order to last you years, or maybe even a lifetime, a pan must he sturdy enough to take the abuse you’re going to give it. It should also be convenient to use and clean and suitable for the kind of cooking or baking you plan on doing. Buying bread baking tools and baking pans of good quality for regular use is usually a good buy in the long run. On the other hand, it may not make sense to pay for top quality pans and utensils that you never really use. Quality of bakeware can be judged to some extent by appearance, but to be sure of what you are getting, look for utensils with descriptive labels. For example, don't just buy a spatula, buy a high heat, stain resistant spatula and you'll have something that will last through years of batters, biscuits and doughs. Utensils that can serve several purposes are better buys than specialty pans from the standpoint of both money invested and storage space. I recommend that you refrain from purchasing single use kitchen equipment, although there are exceptions to this rule. Here is my list of essential bread baking tools. Scroll to the bottom for the printable PDF version. A small saucepan, about 1-pint size. This is useful for scalding milk and melting shortening. A bowl scraper. This may be rubber or plastic. A medium-size spatula or plain knife. Rolling pin, with or without stockinet cover. Oven thermometer, to double check the temperature of your oven. Electric mixer or food processor. Bread lame (a razor for making slashes in your bread dough). This is for hard-core home bread bakers. Banneton basket for adding a decorative design to your bread dough while it is rising. Instant read thermometer- to measure the temperature of your liquids, also to take internal temperature of the bread to ensure doneness. Ove glove- to safely handle hot breads and pans. A Dutch oven with a lid or a clay baker- for baking breads in micro climate of sorts. This produces an extra crispy crust. A baguette pan- for making baguettes. I actually found a new one at a thrift store for $3!!! 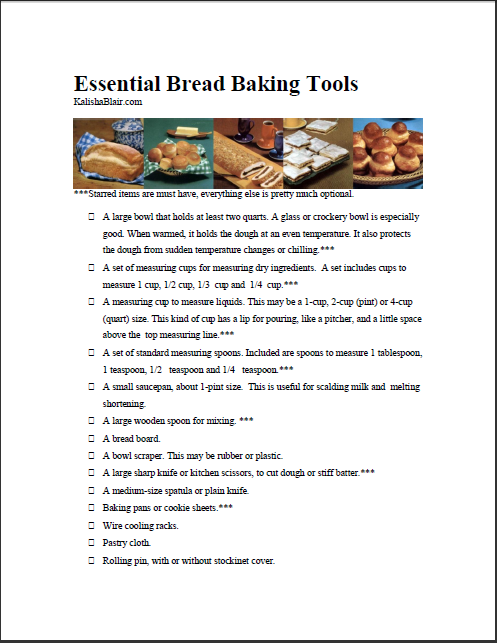 Download the printable Essential Bread Baking Tools Checklist! These cranberry sauce are an amazing way to use up any left over cranberry sauce from the holidays. I used homemade cranberry sauce, but you can use canned cranberry sauce as long as it's the one with whole cranberries. BBQ pulled chicken is so easy to make, especially if you use your slow cooker! It's a quick and filling weeknight meal that's so good you won't be tempted to get take out. Watch me make this simple zucchini bread during a Facebook live video!